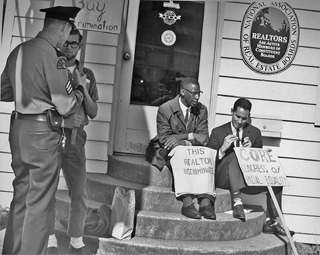 Seattle CORE activists taking a rest from picketing a discriminatory real estate office, 1964. (Photo courtesy of the Seattle Municipal Archives.) Here are reports about CORE open housing campaigns and more. See a database of over 170 digitized articles from Seattle-area newspapers debating the open housing ordinance during the 1964 election. 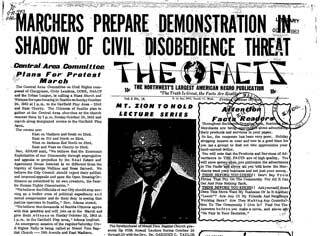 This flyer from the 1966 school boycott is one of dozens of papers and documents digitized here. 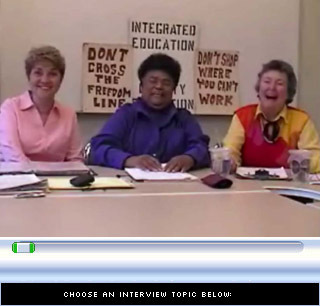 Oral histories of activists from CACRC, CORE, CAMP, and open housing struggles are linked from this site, including this interview with Seattle CORE activists Joan Singler, Bettylou Valentine, and Jean "Maid" Adams. 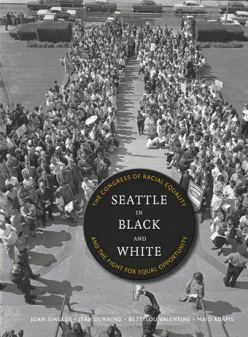 For more on this subject see the new book Seattle in Black and White: The Congress of Racial Equality and the Fight for Equal Opportunity by Joan Singler, Jean Durning, Betty Lou Valentine, and Maid Adams (University of Washington Press, 2011) and the associated website. This special section highlights Seattle’s early 1960s civil rights history, particularly that based in the Central District neighborhood. African Americans in Seattle faced not outright segregation, as in the Jim Crow South, but a public endorsement of equality combined with private discrimination in housing policy, employment, commercial establishments, hospitals, schools, and restaurants. Housing segregation, instituted in the early 1900s, confined the majority of Seattle’s African-American community to the neighborhood known as the Central District, located between downtown Seattle and Lake Washington. By the 1960s, the Central District had developed into the heart of civil rights struggle in Seattle, and during the early 1960s, several organizations were founded in the neighborhood to combat the institutionalized segregation and lack of services. The Seattle chapters of the Congress of Racial Equality (CORE) and NAACP, the citywide Central Area Civil Rights Committee (CACRC), and the Central Area Motivation Project (CAMP) spearheaded numerous campaigns against employment discrimination, police brutality, school segregation, and for open housing. The civil rights organizations of the early 1960s—with their strategies of nonviolence and negotiation combined with direct action boycotts and pickets—bridged the coalition-building and networking strategies of 1940s activists with the more radical strategy and vision of the Seattle Black Panther Party, founded in 1968. Papers and documents: Over seventy flyers, reports, and papers from CORE’s Open Housing and DEEDS campaigns, issues of CAMP’s newspaper The Trumpet, and more documents from early 1960s civil rights campaigns in Seattle. This section made possible by the University of Washington Library’s Special Collections and Microfilm and Newspaper divisions. Open Housing News Coverage Database: We have digitized more than 170 news articles that appeared in Seattle-area newspapers debating the open housing ordinance before the March 1964 election. Discover the different arguments for and against open housing, as well as an archive of pro-open housing articles printed in the Central District newspaper The Facts. Jessie Kindig is the coordinator of this special section on CORE and Central Area Civil Rights Campaigns, 1960-1968.